Still not very mobile, the eclosed beetle has its full color. Jim, this is Agrilus bilineatus. 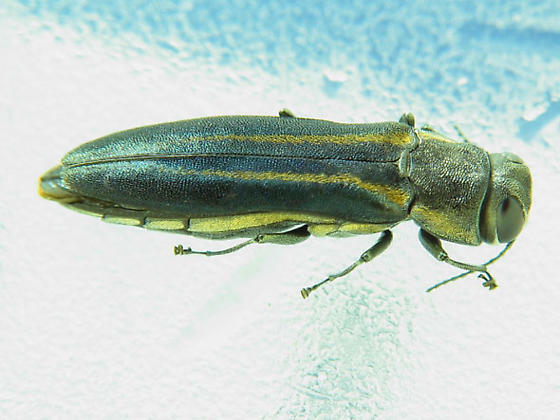 The blueish elytra and yellowish strips could make this Agrilus bilineatus carpini. I am not sure, but A. bilineatus is a definite. Great shots. Josh, just for info - I can't recall off hand who proposed this, but carpini has been elevated to sp. status. I actually read that last night. Nelson and Hespenheide elevated it to species in 1998. Just did not have time to get back to the comment I made. Thanks Phillip. Your welcome. The common name is Two-lined Chestnut Borer. Like the one you have, I have collected several of these from oak. Great images, Jim. The two-lined chestnut borer has adapted well to other trees since its orignal host has gone virtually extinct....Also, some specimens of this species have the elytral vittae (stripes) largely obsolete. They seem to be quite common on trunks of dead, standing beech in my experience, but are very wary and fly off at the slightest hint of danger.